The exchanged emails below were with the offices of the Chief District Court Judge of Durham County (NC) and Durham's Chief Public Defender. These offices are currently held by Marcia H. Morey and Lawrence M. Campbell, respectively, whose behavior has been more than suspicious. The transmittals speak for themselves and reveal a beguiling attempt to lure Spencer C. Young to travel from out of state to Durham, NC, where a diabolical scheme has been set to again take away his freedom through an ongoing FRAUD of epic proportion -- in the continued effort to cover-up the felonies of Durham judge David Q. LaBarre and his girlfriend, Leah R. Krier, as well as the reckless prosecutorial actions of Durham District Attorney, Leon A. Stanback. Please forward this to Judge Morey and confirm receipt -- thank you. This BOGUS hearing is a set-up and MUST be "continued" in legal parlance (i.e. STOPPED from happening on May 6th) -- and a special prosecutor (from the North Carolina Dept. of Justice) needs to be brought in. Because of the magnitude of the underlying scandals that have procreated this travesty of justice, this has been distributed widely -- e.g., over 2,500 news media outlets, every UNC Law school official and each Town Council member, to name a few. It also been posted online, and circulated among sympathetic activist networks. This travesty MUST be Stopped. Please read the attached letter, which was delivered to Chief Durham District Court Judge Marcia Morey seeking a simple and certainly justified one-month continuance (i.e., postponement) of a May 6th hearing on the two remaining BOGUS misdemeanor charges, which are even more preposterous than the PHONEY felony charge that has been dismissed. The response I received is reflected in the email below, while hyper-links denoted herein provide additional information. This response is reckless and outrageous, and further suggests an omnipresent level of corruption in Durham County. The rationale offered is patently absurd, and disregards common-sense operative facts (see letter). In other words, it's this kind of flawed judgment and bombastic behavior by public officials that undermines the public's trust en masse. I am being denied the right to defend myself against completely FABRICATED charges because the latest public defender failure (Daniel Meier) has done nothing and has intentionally blocked me from engaging competent defense counsel. And let's not forget, the real purpose of these charges is to COVER-UP the FELONIES of Judge LaBarre and his girlfriend in the "LaBarre Larceny Scandal". And what I find especially troubling is that BOTH of you have ignored my phone calls and emails, which is frankly inexcusable under the circumstances. 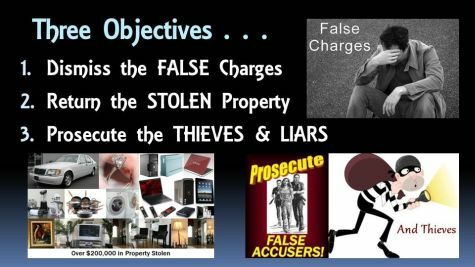 Judge David Q. LaBarre and his girlfriend committed extensive felonies; and District Attorney Leon Stanback recklessly prosecuted charges he knew to be false in an effort to COVER-UP the misdeeds of his long-time friend and colleague. (Note to those copied herein: LaBarre & Stanback are BOTH "retired" Durham Superior Court Judges). Stanback and LaBarre collaborated to commit extensive civil rights violations, manifested in my being violently arrested by a US Marshal SWAT team, incarcerated with the most violent of felons for 127 days, while being UNLAWFULLY DENIED BAIL and fraudulent extradited. This is beyond outrageous . . . in fact, this is an assault on American Civil Liberties and the U.S. Constitution, and must NEVER be tolerated. And the third objective includes uncompromised actions to . . .
" Extract & Disbar Stanback & LaBarre "
. . . as they have abused their vested authorities and represent a clear and present danger to the public. Note: Here is just ONE example of "why" these remaining BOGUS charges were to be dropped: The alleged phone conversation in December 2012 never occurred and could not have occurred because all calls had been blocked. Moreover, the only attempted communications prior thereto simply requested the return of over $200,000 of stolen property, which is a Constitutionally protected right. The other dead give-away of this FRAUD is that the "charge" wasn't made until 7 months later, and NOT coincidentally, three days after a criminal indictment was filed against Judge LaBarre and his girlfriend. If you are unable to discern such an obvious ruse, then you have no business heading up the Durham's Public Defender office. Subject: RE: Please Call Me . . .
Chief District Court Judge Marcia Morey would not continue your cases (12CR56270 & 12CR56466) due to the age of the cases. The cases have been pending since October 29, 2012. She suggested that you contact Mr. Lawrence Campbell, the Public Defender of Durham County at 919-808-3260 to see if he can be of any assistance to you. Subject: Please Call Me . . .
. . . before you leave today. Thank you. Subject: RE: Request for Continuance AND My Cell Phone Number . . . I did receive your e-mail. I will forward to Judge Morey when she returns to her office. Following up on our phone conversation today, please refer to attached document. Thank you for your kind assistance.